Winter might be over, but that doesn’t mean it’s going to be always sunny and warm. The first half of spring is usually accompanied by a slight chill in the air during sunset. Since it's spring, you probably want to spend some time outside, and the best way to get through that chill is by setting up an outdoor patio heater. Infrared heaters are really the only option when it comes to effectively heating an outdoor patio. Heat generated from infrared heaters come from invisible rays that are unaffected by the wind or outdoors. These infrared rays don’t warm the air(like tradition convection heaters), they warm the people and objects that are within it’s range. Other types of heaters rely on a source of heat(usually fire or heated coils) to heat the air; the warmed air then circulates through the room, heating the area. In an outdoor setting infrared heaters will always be more efficient heaters than traditional heaters. This is why infrared technology has safely been used in patio heaters for over 50 years! When choosing which outdoor patio heater will work best for your home, you should pick based on which fuel it uses, it’s features, and it’s style. For example, if you have enclosed patio you could use a hanging heater to free up floor space. As the name suggests, these heaters burn natural gas to heat the infrared emitter. Natural gas is both cost efficient, and convenient. As long as your home has a gas line, you should be able to hook your NG heater directly to that. Which means you won’t ever have to change any fuel canisters, and your heater will take up less space. Your costs for heating would be reflected in your monthly gas bill. Liquid propane is the other common fuel used in gas heaters. 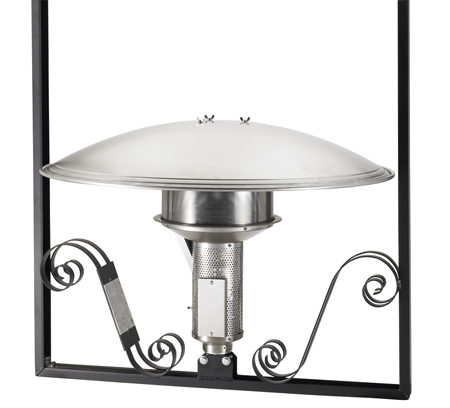 LP heaters are the most popular option when it comes to outdoor heaters. The best benefits of a propane heater are that they're mobile, and very easy to setup. The propane tank is enclosed in the base of the heater making it an independent unit. Mobile heaters have wheels built in for easy positioning. Propane is readily available as well; most gas stations and hardware stores sell propane tanks, and propane refills. Alternatively, in some areas, there are suppliers who offer propane refilling services. So, you wouldn't have to worry about refilling your patio heater with propane. Some electric infrared patio heaters are safe for outdoor and indoor use. There are many different styles, models, frames, and features available. These options give homeowners an incredible amount of control when designing the perfect patio. Because they can be deployed indoors, they can also be installed in a garage or bathroom. Electric heaters can also allow for greater control of temperature output; with heat input regulator switches or more advanced home management systems. These infrared heaters can also be installed flush in your ceiling or wall for a sleek look that saves space. To learn more about the best patio heating option for you, get in touch with AEI, we’d be more than happy to answer your patio heating questions.